Ah, California. You know the images: the bright lights of Hollywood, the hurly-burly of Los Angeles, the beautiful people lying on the sun-kissed beaches. The lifestyle in the Golden State is hot - but so is the unspoiled scenery. The Mamas The Papas went California dreamin'; while we were there, it was California Steamin'. My girlfriend and I began our desert journey by driving over the Cuyamaca Mountains east of San Diego into the misty, cool, tree-hugged retreat of Julian - home of some amazing fruit pies. The only preparation this gave us for what lay ahead was that, these too, were baked. Desert... what desert? Then it hit us. Just beyond Julian the clouds parted like a veil, literally steaming away into clear blue sky. Below were the badlands, stretching away in cactus-strewn solitude for hundreds of miles, hemmed in by naked brown mountains. Gulp! Borrego Springs, in the Anza-Borrego desert, was a centre of sorts, but as might be expected, it was not a heaving metropolis; although, it did have its own airfield. Not surprisingly, few folks made it outdoors during the soaring temperatures of the day. Being English, we didn’t let small things like that worry us. Ready to tackle anything, that's us. Do not, I repeat do not, try the Palm Springs trails in the middle of a June day. Although relatively lush, with shrubs lining the valley floor, it was not especially sheltered and the sun beat down relentlessly. The trail to the oasis was only a mile or so, but we never made it. Bighorn sheep high on the boulder-strewn valley side peered down warily, but they needn’t have worried about pursuit as we collapsed onto a boulder unable to go further. It was all the lesson we needed. Squinting through the dusty glare of the main street in Borrego, we initially failed to spot a culinary feast for evening meals. So, first night out, we headed for the rather swanky Casa del Zorro, a little out of town. If the heat hadn’t got to me, the prices very nearly did make me keel over. The nest of duck breast and parsnip chips with a rich sauce really was exquisitely presented, but there was no way I could afford vegetables to go with it. We did subsequently locate the local Mexican restaurant where we dined on burritos and chimichangas for the next few days. (A 'chimichanga' is a burrito made with a flour tortilla which is folded then chilled to allow the edges to seal. The burrito is then fried until crisp.) The genuine Mexican beer was tempting too, but the combination of having a hire car and the fact that the local cops liked to eat there too, limited any sampling. From Borrego we drove east to the Salton Sea, where we gazed, panting, at the sight of so much water in such an arid land. Unfortunately it was saline and also shrinking fast. The area around the sea was refreshing green but the irrigation systems needed to keep it so were widely in evidence. This is straining the resources of the inland sea, which was only accidentally created in the first place with a disastrous attempt to dam the Colorado river in 1904. We strolled around salty pans and up onto a rocky promontory. The area was a bird haven with delicate phalaropes swimming on the pools looking for insects, and skimmers and terns cruising overhead. It all seemed very fragile. Returning from here to Borrego on the E22 was an unforgettable experience. This stretch of highway is better known as Erosion Road, and after dark required a strong constitution to navigate the sinuous track, knowing that all around were crazy twists, fold, gullies and canyons waiting to swallow us without a trace. The immense desert rises in altitude to form the Joshua Trees National Park (a days drive to the north east of Borrego). The sign at Key’s Views read ‘Beware of the bees.’ How we scoffed. A few mild-mannered critters buzzed amiably around the car as we got out, seemingly intent on harvesting nectar from the desert flowers dotted around. The abiding memory of this place should be the alien-looking Joshua trees, arms raised as if to heaven, but we had forgotten the few fruit pastilles scattered in the glove compartment. The bees went absolutely wild for them, and who can blame them, given the tough task of finding sugar in their harsh environment. It was some considerable time before all the interlopers were evicted. The possibility of anaphylactic shock was not a pleasant one in a place where hundred-mile views revealed not a trace of habitation. The ultimate of all Californian desert areas has to be Death Valley, not least because of its fearsome reputation. High over the Sierra Nevada to its west stood cool, green Sequoia forests, but just a few kilometres east the sand burned. I thought I had acclimatised to the desert heat by this stage. How else can you explain the ability to stand in searing midday heat at Badwater searching for a unique snail species in the briny puddles? Well, some might/did suggest that I was cracking up as much as the salt pans around me. 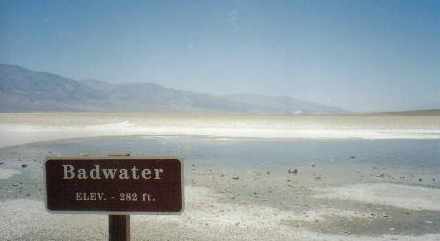 Badwater is the lowest point in the western hemisphere, though the stark surroundings rendered the stats fairly meaningless. The whole valley was a merciless cauldron of fire. Places, often long abandoned, with names including the words 'devil', 'furnace', 'ghost' and 'bad' testified to the toughness of existing here. The cool visitor centre at Furnace Creek was an island in a dry sea. Way to the north, not far from the Oregon border, the desert landscape gained a different toehold at the Lava Beds National Monument. Honeycombed with caves, the area is a paradise for those who like to be holed-up underground in total darkness. Personally, I’m not a member of that set, and we were after an “easy” option. At the ranger station this request met with a flurry of maps... and two headlamps. Grinning sheepishly, we accepted these, realizing that in order to save face, we now actually had to go and do some exploring. And so we headed off to the 3,700-foot long Sentinel cave. Although rather unnerving, and requiring a certain careful placement of feet, the presence of other visitors did somewhat lessen the isolation as we stumbled along the lava tube. Taking off the headlamp and peering behind revealed total and utter blackness. It was a memorable 30-minute trek. Our main base in this region was the very Scottish sounding community of McCloud. This atmosphere was heightened by the ranks of damp conifers, and mist-shrouded slopes of the massive peak of Mount Shasta, providing a welcome retreat from the scorching heat. The McCloud Hotel was a wonderfully eccentric place to stay, with an old hunting lodge feel. Every room was individual in character, and the breakfasts were huge. From here, we headed south-east to Lassen Volcanic Park via Highway 89, for our last hot encounter. 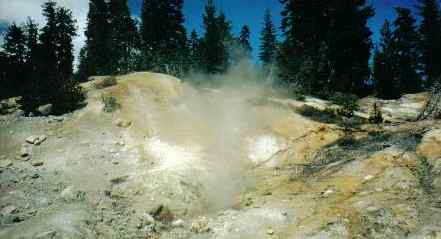 The chill of winter was still very much in evidence with snow piled up to 20 feet high beside the road and so the delights of trails such as Bumpass Hell were denied us. Normal service was resumed however, at the fuming sulphurous pools at the Sulfur Works. Fire and brimstone bubbled all around a short boardwalk circuit. After all that, there was only one thing left to do. We headed to the café for a cool drink. 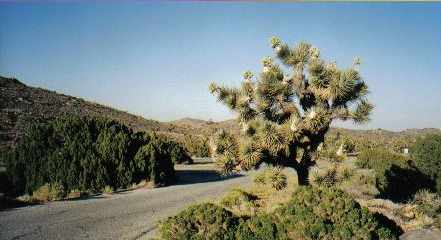 General information about deserts in the USA - including Borrego Springs. Help in planning a trip, vacation or obtaining data about this park. If you enjoyed reading the above article then you will probably also enjoy New Zealand's South Island by Graeme Down, and Downeast in Maine, also in North America, and our latest articles covering the Orinoco Delta, La Mata, Marbella and Beijing. A simple fable, based on simple truths and places in a highly unique situation. 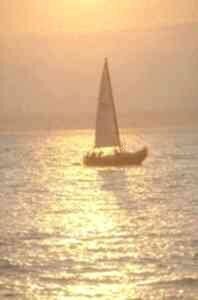 An Andalusian shepherd boy one night dreams of a distant treasure in the Egyptian pyramids. Then he's off, leaving Spain, literally following his dream.